Transmissible spongiform encephalopathies (TSEs) are neurodegenerative diseases affecting both humans and animals. They are associated with post-translational conversion of the normal cellular prion protein (PrPC) into a heat- and protease-resistant abnormal isoform (PrPSc). Detection of PrPSc in individuals is widely utilized for the diagnosis of prion diseases. TSE brain tissue samples have been processed in order to quantitatively isolate PrPSc. The protocol includes an initial homogenization, digestion with proteinase K and salt precipitation. Here we show that over 97 percent of the PrPSc present can be precipitated from infected brain material using this simple salting-out procedure for proteins. No chemically harsh conditions are used during the process in order to conserve the native quality of the isolated protein. The resulting PrPSc-enriched preparation should provide a suitable substrate for analyzing the structure of the prion agent and for scavenging for other molecules with which it may associate. In comparison with most methods that exist today, the one described in this study is rapid, cost-effective and does not demand expensive laboratory equipment. Scrapie, bovine spongiform encephalopathy (BSE) and Creutzfeldt-Jakob disease (CJD) are all related transmissible spongiform encephalopathies, the common major causative agent of which is believed to be a protease- and heat-resistant, beta-sheet rich isoform (PrPSc) of the normal cellular prion protein (PrPC) . The patho-physiological identity of the infectious agent has not been understood so far, although there is sufficient proof that the conversion of PrPC to PrPSc plays a crucial role during pathogenesis . Clinically, the disease is characterized by long incubation periods which, as in the recent crossover of the bovine spongiform encephalopathy (BSE) agent to humans, may be prolonged further when the disease is transmitted from one species to another. Necropsy findings from TSE cases generally show accumulation of PrPSc in the brain, accompanied by extensive neurodegeneration, which is also the major cause of fatality. Similar deposits have been demonstrated as well, in some of the peripheral organs and the lymphoreticular compartment in certain species [3, 4]. Today, the ultimate confirmation of the disease comes only after post-mortem examination of the brain, even though extensive research being carried out in the field offers hope for pre-clinical diagnosis through the detection of PrPC in tonsils or body fluids. Clinical signs of neurodegeneration, supported by the presence of characteristic microscopic lesions and PrPSc in the brain  are signs that eventually lead to the diagnosis of TSEs. As well, the clinical indications, histopathological symptoms and glycoform pattern of PrPSc isolated from experimental animals are typical of the 'strain' or species origin of the inoculums . A number of in vitro assays have been reported for the detection of PrPSc in the tissue, including the dot-blot immunoassay, enzyme-linked immunosorbent assay (ELISA), immunocytochemistry, Western blot analysis, and recently, capillary electrophoresis [7–12]. At present, the template source of PrPSc for all these procedures is either the crude brain homogenate or a harshly processed preparation called scrapie associated fibrils (SAF). While these procedures take relatively less time to perform, in vivo bioassays requiring the inoculation of laboratory animals such as mice or hamsters with the infected material have been used over the years for the detection of prion diseases. The main disadvantage of the bioassay technique however, lies in the lengthy incubation period that incurs between inoculation and appearance of clinical symptoms, compounded by the expense of maintaining large animal colonies. Therefore, scientists working in the field of prion diseases most often prefer in vitro methods of diagnosis when there is no absolute requirement to use laboratory animals. In order to routinely detect PrPSc in specimens, reliable, quantitative and yet relatively simple protocols are necessary for its isolation. Here we report that over 97% of total PrPSc in a brain sample may be detected in vitro following an exceptionally short and simple precipitation method of enrichment for the protein. The method was validated within a European Union consortium of several laboratories for standardization of the diagnosis of BSE and scrapie by estimating the limiting dilution of detection of PrPSc from infected brain. Using multiple preparations from five different species, we also showed that the method described herein concentrated PrPSc without altering the PrPSc glycoform pattern, a quality that makes this protocol suitable for glycotype analyses for species or strain identification of the infectious agent. Infected brain tissues from mouse scrapie, strain ME7, were obtained from FRCVD, Tubingen, Germany and mouse BSE, strain 301 V from VLA, Weybridge, UK. Brain tissues from sheep with natural scrapie or normal sheep were obtained from the School of Veterinary Medicine, Aristotle University, Thessaloniki (courtesy Prof. O. Papadopoulos). BSE brain samples were obtained from VLA, Weybridge, UK and the human CJD brain samples came from recently reported cases of sporadic CJD (sCJD) from within Greece . All tissues were stored at -70°C until use. Autolytic deterioration was observed only in tissues from the BSE cases due to handling during transportation etc. Area of choice of the tissue for each species depended on relevant data from our own and other laboratories. A 10% homogenate of the tissue was prepared in cold homogenization buffer (0.5% IGEPAL CA-630 (NP-40) and 0.5% sodium deoxycholate in phosphate buffered saline, pH 7.4) using a polytron homogenizer (Kinematica, Switzerland) at setting 4, twice for 6 seconds each. For limiting dilution experiments, the polytron was replaced with the OmniGLH homogenizer (CAMLAB, UK) which worked equally well with disposable probes, a very useful factor to be considered while attempting multiple homogenizations with large number of samples. All homogenates were stored in aliquots at -70°C until use and thawed only once. On the day of use, 100 μl of homogenate was diluted with an equal volume of the homogenization buffer and incubated with proteinase K (Sigma-Aldrich) for 1 hour at 37°C with mild rocking. Concentrations of proteinase K used varied with the species and are provided separately with each figure. The reaction was stopped by the addition of 5 mM PMSF (Sigma-Aldrich), a protease inhibitor. The proteinase K digestion mixture was diluted with 300 μl phosphate buffered saline (PBS) pH 7.4 and brought to 10% NaCl by the addition of an equal volume of 20% NaCl in PBS containing 0.1% sarkosyl. The tube was kept in ice for 10 minutes with occasional shaking. After centrifugation at 16,000 g for 10 minutes at room temperature, the pellet was washed once with 25 mM Tris-HCl buffer, pH 8.8 containing 0.05% sarkosyl (w/v) and centrifuged again at 16,000 g for 10 minutes. The final, enriched pellet was then resuspended in 2.5× loading buffer 10% v/v glycerol, 50 mM Tris pH 6.8, 2% w/v SDS, 3% β-mercaptoethanol and used for detecting PrPSc by western blotting. Normally, for a starting volume of 100 μl homogenate (10 mg brain equivalent) the final pellet was resuspended in the same volume (i.e. 100 μl) of loading buffer, of which 30 μl (3 mg brain equivalent) was loaded per lane for the western blot analysis. In order to estimate any loss of PrPSc during the extraction procedure, total proteins in the supernatants from both the precipitation step and the wash step were precipitated with 9 volumes of methanol overnight at -70°C. After centrifugation at 16,000 g, the supernatants were discarded and the pellets resuspended in loading buffer (see above) and used for western blot detection of PrPSc as described below. Proteins were subjected to electrophoresis using a 12 or 15% Laemmli sodium dodecyl sulfate polyacrylamide gel (SDS-PAGE) and transferred to a PVDF membrane (Sigma-Aldrich) and incubated with the primary antibody for 1 hr. This was followed by washes with PBS, pH 7.4 and a further incubation for 35 minutes with the corresponding secondary antibody. All incubations and washes were done at room temperature. The primary antibodies were SAL1 (manuscript in preparation), or 6H4 (Prionics AG, Switzerland) depending on the species being tested. Details of the use of primary and secondary antibodies is given in the figure legends. Following three washes of 15 min each, the reaction was visualized using the CDP star (New England Biolabs) chemiluminiscence detection technique according to manufacturer's instructions. The membranes were exposed to X-OMAT (Kodak) X-ray films for between 5 seconds to 5 minutes depending on the degree of positivity in the starting material. Where P is the final pellet, W1 is the supernatant after salt-precipitation and W2 is the supernatant after the final wash. The initial crude homogenate, pellet after the final wash, and the supernatants after salt precipitation and the final wash, the latter two precipitated in 9 volumes of methanol at -70°C, were subjected to electrophoresis using an SDS-PAGE system as described earlier. To avoid overloading the gel, ten times less brain equivalent (0.3 mg) was loaded for the crude homogenate than for the other samples (3 mg each). The procedure used for staining was a standard method . In short, the gel was fixed in 50% methanol and 12% (v/v) acetic acid for 1 hour, followed by incubation in 10% ethanol and 5% acetic acid (v/v) for another hour. This was followed by treatment with 3.4 mM potassium dichromate in 2.8 mM nitric acid after which the gel was washed with distilled water and incubated for 30 min with shaking in 20% (w/v) silver nitrate. The reaction was developed in 3% sodium carbonate containing 0.5 ml formaldehyde 37% (paraformaldehyde) per liter and stopped by the addition of 2.3 M citric acid when the bands were clearly visible. Intensities of the lanes due to total proteins were estimated as described above. Pooled homogenates of cerebellum from scrapie positive sheep (P1) or brain stems from BSE positive cattle (P2) were prepared as described above. Similarly, homogenates were also prepared from healthy sheep (N1) or healthy cattle (N2). In order to achieve different degrees of tissue positivity, P1 and P2 were initially diluted up to 50% or 6.25% with N1 and N2, respectively, and the resulting mixtures then used for precipitating PrPSc as described in the steps above. Undiluted P1 and P2 served as positive controls (100% positivity) whereas N1 and N2 served as negative controls for these experiments. Prior to loading on the NuPage (Invitrogen) western blotting system, the final pellet from each sample was subjected to eleven 2-fold serial dilutions with loading buffer. The 6H4 monoclonal antibody was used to detect PrPSc on a PVDF membrane and the positive signal was analyzed on a Bio-Rad Fluor-S multiImager (Bio-Rad, USA). The validity of the current protocol to enrich for PrPSc from different species and its use in glycotyping, the technique currently employed for species and strain identification, was examined using both experimental and native TSEs. Homogenates of mouse scrapie or mouse BSE whole brain, native sheep scrapie cerebellum, BSE brain stem or sporadic CJD cortex were used for this purpose. PrPSc was precipitated from all species using 10% sodium chloride as described above and detected on a western blot using the polyclonal antibody SAL1. In order to perform glycoform analysis, band intensities of the double-, mono- or non-glycosylated isoforms were determined in each sample and each glycoform was expressed as a percentage of the total signal obtained. The migration pattern of PrPSc in the final enriched pellet (P) and in the supernatants from the salt-precipitation (W1) and wash (W2) steps from a sheep scrapie sample is shown in Figure 1a. Loss of PrPSc in the discarded supernatants in the two preceding steps was estimated to allow the calculation of the degree of its recovery at the end of the procedure. PrPSc-specific signal was discerned as the classical three-band pattern representing the double-, mono- and non-glycosylated isoforms, each of which was typical of the individual species studied. The sum of the signals obtained from P, W1 and W2 accounted for total PrPSc in the starting material, and the percentage recovery of PrPSc was calculated as described in Methods. As shown in the inset table, as much as 97.4% of PrPSc was found in the pellet with minimal loss in the supernatants, either from the precipitation (2.08%) or the final wash step (0.5%). These calculations are indicative from this particular experiment, whereas variability of the recoveries is approximately 2%. Comparison of PrP Sc and total protein during the enrichment process. A) Western blots depicting the migration pattern of PrPSc in the final enriched pellet (P) and in the supernatants after the precipitation (W1) and the wash (W2) steps in native sheep scrapie. Total proteins in W1 and W2 were precipitated with 9 volumes of methanol over night at -70°C. SAL1 (1:3000) was used as the primary antibody and alkaline phosphatase labeled goat anti-rabbit IgG (1:1500, Roche) as the secondary antibody. Each lane contains 3 mg brain equivalent. The table shows percentage recoveries of PrPSc in P, W1 and W2. The estimations were made by first determining the values for integrated optical density (IOD) due to PrPSc for each lane. The sum of the values in P, W1 and W2 was then taken to be one hundred percent total PrPSc in the starting material. Values due to PrPSc in each of P, W1 and W2 were then deduced as percentages of the sum total as described in Materials and Methods. Proteinase K used was 30 μg per ml homogenate. B) Silver staining of H (starting undigested homogenate), P, W1 and W2 run on a SDS-PAGE system. All lanes contain 3 mg brain equivalent loads except for lane H which contains 0.3 mg of the same. Molecular weight markers are shown in lane M. It may be noticed that the some of the proteins present in H are also present in W1, in the discarded supernatant after the precipitation step. Lanes P and W2 contain few detectable proteins. The table provides a quantitative estimation of the degree of purification of PrPSc in P after taking into account, signals due to total proteins in lanes H and P respectively. 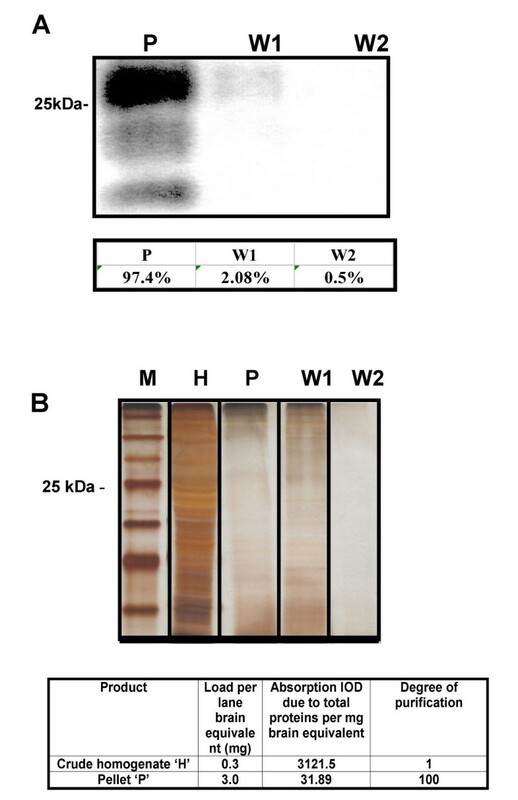 Figure 1b shows staining for total proteins in the crude homogenate (H) and in the fractions P, W1 and W2 that were produced through the sodium salt precipitation procedure, each expressed as integrated optical densities (IOD). Most cellular proteins remaining after protease K digestion were present in supernatant W1 that was discarded after salt precipitation, leaving relatively few proteins in W2, the supernatant from the wash, and in the final pellet, P. Intensity in lane H represents signal due to total proteins in 0.3 mg brain equivalent of the initial crude homogenate (the brain equivalent amount loaded with the total homogenate was ten times less in order to enable smooth running of the gel). All other lanes contain 3 mg brain equivalents each. The inset table shows values for intensities in lanes H and P, and gives the degree of purification of PrPSc in lane P as a result of enrichment. As may be seen, the IOD value in P (31.89) is 2 logs less than in H (3121.5) indicating an 100-fold reduction in total proteins in P. In conjunction with Figure 1a, where 97.4% of the total PrPSc is shown to be present in P, it is clear that the degree of purification of PrPSc in the final pellet was a hundred times that of the initial homogenate, H.
Low limits of PrPSc detection are essential for a method to be successfully applied to the determination of animals in the pre-clinical stages of the TSE disease. It was therefore considered mandatory to test the capability of the current protocol for determining minimum positive tissue equivalents in normal tissue homogenates spiked to various degrees with infected tissue. The lower limit of detection of PrPSc using the current protocol was estimated using pooled brain homogenates in order to avoid sample to sample variations. Thus, pooled homogenates of cerebellum from scrapie positive sheep (P1) or brain stems from BSE positive cattle (P2) were used and similar homogenates from healthy sheep (N1) or healthy cattle (N2) served as negative controls. For both scrapie and BSE, the positive (100% positivity) and negative (0% positivity) homogenates were blended in ratios that provided final mixtures containing 100%, 50%, or 6.5 % positive tissue material. PrPSc was then precipitated from each of these and the lowest limits of detection were determined using western blot analysis. 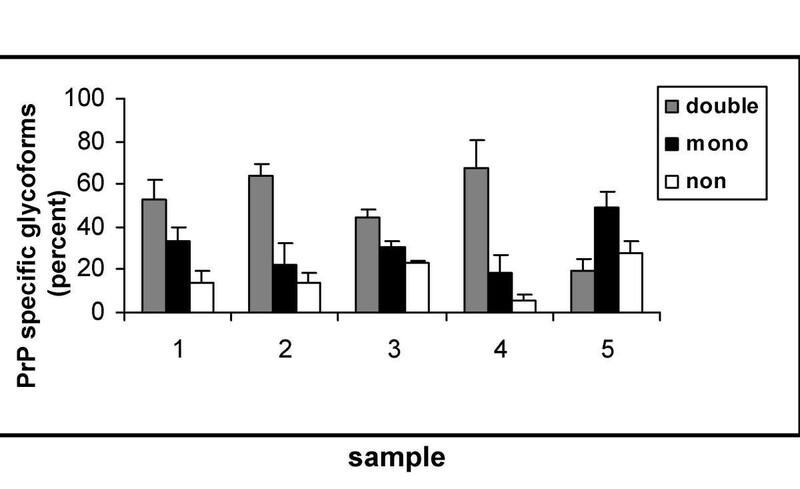 For both scrapie (Figure 2a) and BSE (Figure 2b) samples, the lowest detection limit ranged between 5–10 μg brain equivalents. Comparison of signal detection after blending PrP Sc positive and negative homogenates in different ratios in A) sheep scrapie and B) BSE. 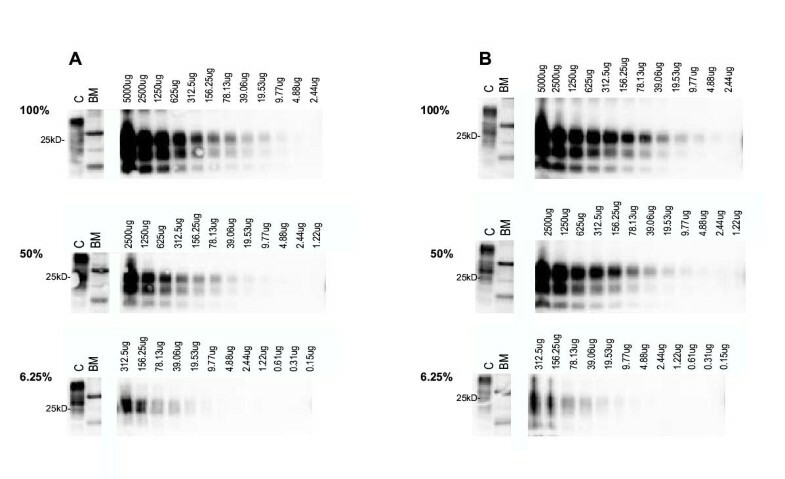 In each case, western blot analysis is shown for 100% positive tissue (top panels); 50% positive tissue (middle panels); and 6.25% positive tissue (bottom panels). Antibodies used were 6H4 (1:5000) and alkaline phosphatase labeled rabbit anti-mouse (1:5000), both from Prionics. Lanes show: C – 10% negative brain homogenate, unprocessed and without proteinase K digestion; BM – molecular weight marker. Amounts listed above other lanes indicate the amount of positive tissue equivalents loaded. Staining seen in the negative sample was considered to be due to improper digestion of the tissue. Amount of proteinase K used was 100 μg per ml homogenate in each case. The negative control and all test samples were processed by the described salt precipitation protocol. The signal seen in lane C may be attributed to cellular prion protein, PrPC, present in normal brain tissue. Since TSEs affect a variety of species, we also tested the efficiency of the sodium chloride method of PrPSc enrichment on brain tissues of animals with natural and experimental forms of TSEs. This was considered important because of the species-related differences in the tissue distribution and glycoform patterns of PrPSc. Brain equivalents of 3 mg each in cases of scrapie, BSE and CJD, and 2 mg each in cases of mouse scrapie and mouse BSE were loaded into each lane of an SDS-PAGE gel for western blot analysis. It has been observed during routine laboratory practice, however, that with animals suspected to have TSEs or with doubtful positive signal for PrPSc, the load per lane could be increased up to 10 mg brain equivalents, thereby increasing the probability of detecting PrPSc. This is accomplished by resuspending the final pellet in a smaller volume of loading buffer. Mouse samples were particularly useful as standard controls for glycoform analyses as total brain homogenates were used in these cases and thus uniform patterns, uninfluenced by the choice of a certain area of the brain, were obtained on the western blot. Banding patterns representative of each species are shown in Figure 3. All samples were processed and electrophoresed simultaneously. The sporadic CJD (sCJD) case in lane 5 was of sporadic type 2 from Greece . Quantitative estimations of the glycoforms for each species are given in the histogram in Figure 4. Average values and their standard errors were obtained for each species after analyzing multiple samples in each case. In all cases, the glycoform patterns presented by PrPSc matched those previously reported in the literature [14–16] and was not affected otherwise by the current method of enrichment. Detection of PrP Sc in TSEs from different host species. Lanes show: 1 – mouse scrapie ME7, 2 – sheep scrapie, 3 – mouse BSE, 4 – BSE, 5 – sporadic CJD, 6 – normal sheep. Lanes 1 and 3 contain 2 mg and lanes 2, 4, 6 contain 3 mg brain equivalent load each. SAL 1 (1:3000) and alkaline phosphatase labeled goat anti-rabbit IgG (1:1500, Roche) were the primary and the secondary antibodies respectively. Amounts of proteinase K used per ml homogenate were 30 μg in the cases of mouse scrapie, sheep scrapie and BSE and 50 μg in the case of sCJD. Glycoforms of PrP Sc isolated from different species. Samples 1–5 represent ME7, sheep scrapie, mouse BSE, BSE and sporadic CJD respectively. Percentages of specific glycoform are shown as average + standard error for each species. Values shown were obtained from independent experiments with 7 ME7 samples, 8 sheep samples, 2 mouse BSE samples, 5 BSE samples and 5 sCJD samples. Bars represent percentage glycoforms of double, mono and non-glycosylated bands according to the insert. The first cases of BSE were reported in the United Kingdom  and since that time the cattle disease has been implicated as a causative agent for new variant CJD in humans [18, 19]. Fears have also been raised that BSE may have crossed back into sheep [20, 21] in the guise of sheep scrapie. Given this scenario, two aspects of prion disease monitoring need immediate attention. One is the pressing need for the establishment of reliable, rapid and, at the same time, sensitive protocols for the detection of TSEs from both animal and human sources. The other is that these methods should be easy to perform and cost-effective with minimal requirement for expensive equipment. PrPSc remains the ultimate and sole determinant for a confirmatory diagnosis of TSE. Given this fact, it seems obvious that the successful, efficient extraction of this molecule is of utmost importance. We have shown here that it is now possible to enrich for PrPSc using sodium chloride precipitation and obtain an end product containing up to 97.4% of the total PrPSc in the tissue. Loss of PrPSc in the two wash steps during the procedure was negligible and might well be attributed to the handling of the material. The high degree of purification of PrPSc in the pellet at the end of the method was indicated by a general reduction in total proteins in the final enriched pellet (Figure 1b) suggesting a 100-fold purification for PrPSc in the latter. PrPSc could be extracted even more efficiently from mouse species with a recovery of 99.7% (data not shown), probably due to the uniform and homogeneous constitution of the tissue involved. The method was also tested in more than one species to establish that the electrophoretic mobility of PrPSc thus obtained was not distorted as reported recently with sodium phosphotungstate salt . Thus, PrPSc precipitated with sodium chloride salt in this manner would be well suited for TSE strain and species type analyses. Early in the development of this protocol we noticed that the low speed debris usually discarded during most PrPSc purification procedures contained as much as 20–30% of the total protein in the tissue (personal observation). It was therefore considered useful to include tissue debris in the extraction procedure described in this study and not to use the common practice of 'clearing' tissue homogenates. As would be expected, and as was indeed seen by silver staining (Figure 1b), other molecules also were precipitated along with PrPSc. Although considered contaminants in the present preparation, these molecules could become suitable candidates when searching for other components including proteins, non-proteins or nucleic acids  that participate with PrPSc [23, 24] in prion pathogenesis in the different intermolecular interactions during the course of the disease. The above protocol could be safely recommended as an alternative confirmatory protocol of the commercially available protocols taking into account the achieved concentration was at least 20 times higher. Though less popular than it was once, the SAF procedure also precipitates PrPSc by aggregating it into fibrils, through a rather harsh treatment with sarkosyl [25, 26] and high-speed centrifugation. Although it was the method of choice a few years ago, and still is considered as a confirmatory diagnosis for TSEs by International Office of Epizootics (IOE), SAF preparations are used less today because the method is tedious to perform and requires larger quantities of starting tissue to offset heavy losses throughout (with only 20% recovery of PrPSc). The low recovery is indeed a problem, particularly with samples such as BSE and CJD where there is a constant dearth of available material. In our hands, at least fifty times the amount of tissue reported in the present sodium chloride precipitation procedure was required for the detection of PrPSc as SAFs . When the salt precipitated material was examined for the presence of SAF's there weren't clearly detectable fibrilar structures thus making this protocol improper for the detection of them. The salt precipitation method described here gave satisfactory results with all species of natural or experimental forms of TSEs tested. The finding that the species origin of the tissue did not affect the validity makes the procedure universally applicable for enriching PrPSc in samples intended both for diagnoses of prion diseases and for characterization of the infectious agent. Additionally, the observation that the glycoform pattern of PrPSc[14–16] was not distorted after digestion with Proteinase K indicates that the electrophoretic mobility of PrPSc was not affected. This is an important issue to consider while choosing any purification method for PrPSc because glycotyping has become a useful tool for strain typing TSEs. This study is the first where an attempt has been made to estimate the recovery of PrPSc after its precipitation from brain tissue. The major advantages of the procedure include speed, low cost, simplicity and reproducibility unaffected by species origin. The ability to concentrate PrPSc through precipitation should make it a putative protocol of choice for detecting low amounts of PrPSc, as would be present in preclinical cases. Several TSE testing laboratories have applied succefully this protocol as a confirmatory technique for PrPSc detection (Personal communications). Future experiments to be undertaken include estimations of infectious titers in the PrPSc enriched pellet and validation of the method in the detection of PrPSc from non-neural tissues. The authors wish to thank the European Union for partial funding of this study through FAIR PL 987021 and BMH4-98-6040. They also thank Dr C.H. Panagiotidis for her revisions and her help for preparation of the manuscript. The authors are also thankful for the support from the Greek Ministry of Health through the Center for Control of infectious diseases KEEL. MP performed the precipitations and immunoblots for determination of the degree of purity of PrPSc and the applicability of the protocol to different species. SV-N. participated in the analysis of the data, and drafted the manuscript. MJC and MJS determined the limits of detection for the protocol with scrapie and BSE and they provided the P1 and P2 tissue homogenates. AP provided human brain tissue. MG provided mouse brain material and performed standardization experiments for immunostaining. TS conceived of the study and participated in its design and coordination.